Hmm…not only this garden blog of ours had been neglected, even our garden had been too! Fortunately, our garden continues to flourish under the tender loving care of my better half, John, who patiently toil with the regular watering, weeding and fertilizing of our plants. Regardless, our Purple Passiflora did get exceptional attention from me throughout last month. She was the baby for my garden project in August. I’ve decided to experiment on how best to prune a vine that started out as a seedling. I’ve read that a vining plant has to be pruned regularly to keep its size and maintain bushiness. Here was an opportunity for me to do exactly that as well as to experiment propagating new plants from these young healthy tip cuttings. Previously, I’ve just allowed vining plants in our garden to climb wildly, mostly on a single trunk and looked awful as they aged with straggly leafless trunk that is mostly top heavy. Aug. 2: the young plant had shot up to about 38 cm. Gave its first pinching (pruning) with a sharp knfe, about 2cm above a leaf joint. Retained the vine’s height to about 23 cm tall. Then, snipped a section of the tip cutting and used that to propagate a new plant. All these are illustrated in the photo below. Aug. 19: Delighted to see the young vine growing healthily after its first tip pinching. 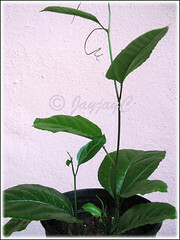 A new shoot had emerged from the top-most leaf node and is due for its second tip pruning as seen in the left image. Happy too to observe that the propagation by stem-cutting is successful with the emergence of a tiny-winy growing bud at the top-most leaf axil. Right picture below, shot ten days later on August 29, shows its success story. 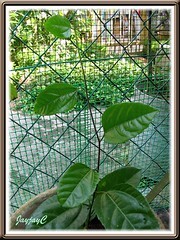 The young Purple Passiflora vine was tip-pruned the second time with a sharp shear and the tip cutting was again used to propagate new plants. This time I cut it into three sections as illustrated below. Section #1 and #2 in the right image have cuts made 1-2 cm below and above the leaf nodes, while the top tip #3 had a cut below its leaf joint. Tendrils were removed. Then, I planted all three sections in a small plastic pot filled with good-draining garden soil as an experiment. Insert the cuttings one at a time into the medium, with the node just touching the surface. Best to plant them individually if you’re serious in getting 3 new plants. Locate the pot in a semi-shaded area with filtered sunlight and keep soil moist. August 29: So amazing to observe that all three sections taken from the second tip cutting are growing fine. 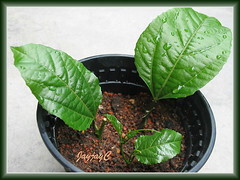 The right image shot on Aug. 29, ten days after the tip/stem cuttings were planted, depicts their good health. Another success story! We’re richer garden-wise from these simple experiments. An eye-opener! 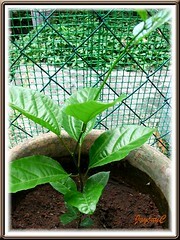 Confident now that such young and tender tip cuttings can be used to propagate new plants. Check out how our Passiflora vines are faring here. Yay, both seedlings flowered for the first time! The first potted seedling at the backyard flowered in mid October 2010 after a 15-month wait, while the second seedling at our frontyard flowered in August 2011 after 2 years. I like browsing through ur photos in flickr. My wife and I, well…mostly my wife, just started our small garden this year and though it’s still unorganised, we love seeing them grow and enjoy the colours of the flowers. Hi Passionate Blogger! Thanks for visiting and leaving your kind comments. Glad to hear that you enjoy my flickr photos. Hehe…my gardening passion shows in my garden shots, right? Hope your garden flourishes for both of you and give much delight and enjoyment. Im so amazed to note that passiflora plant can grow in such a short stalk. 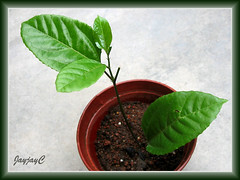 I have gotten the seeds from a passion fruit of which I bought it from a market. I may need to organise my garden first before planting this one. Thanks for your tip and your passiflora stage by stage info. I really gives a lot of information of what to watch out for. I had wanted to direct you here to show you that you can grow your Bleeding Heart vine this way (remembering you’ve used old hard stems instead), but had procrastinated as usual. Anyway, I’m so glad that you’ve visited and acquired some useful info. Frankly, we were as amazed that such young tips can be used to propagate new plants, especially the very top tip….what an eye opener for us too! Yep, I guess I had procastinated and had forgotten all about it, or rather, didn’t have the heart to see a plant die in my pot. I had planted Bleeding Hearts in 3 different pots and planted the left over tips in a small milk tin can. All were successful – it took about 45days for it show some signs of life, once its started sprouting – it came together with the blooms. Now, its constantly flowering. But now my garden is so overcrowded and messy & displaced that I really have no clue what to arrange or do. Still got my passiflora seeds and this & that waiting in the list. Sorry for the long comment – Thanks a lot for the support!!! Thanks for visiting and leaving your thoughts here, James…I really enjoy receiving comments and learning from others too. I’m so happy for you, James! Your passion and patience paid off handsomely!